Especially characteristic of cedar swamps, but occurs in a diversity of moist forests and banks, usually under conifers, often in moss. A very easily recognized plant at any time of the year, by the trifoliolate evergreen leaves, absence of a leafy stem, and slender bright yellow-orange rhizome. 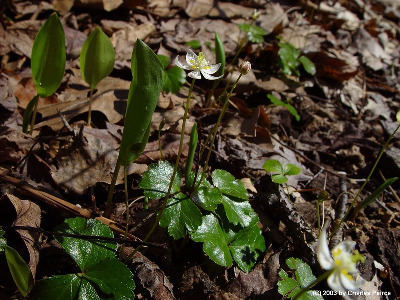 The flowers, in early spring, are less than 2 cm in diameter, with conspicuous white sepals (sometimes a little pinkish on the back) and relatively inconspicuous spatulate, clavate, or knob-tipped nectariferous petals (or staminodia). The peculiar stalks of the carpels begin to elongate during anthesis, and the umbel-like cluster of stalked follicles is distinctive in summer, when even the mature scape is seldom much over 12 cm tall. MICHIGAN FLORA ONLINE. A. A. Reznicek, E. G. Voss, & B. S. Walters. February 2011. University of Michigan. Web. 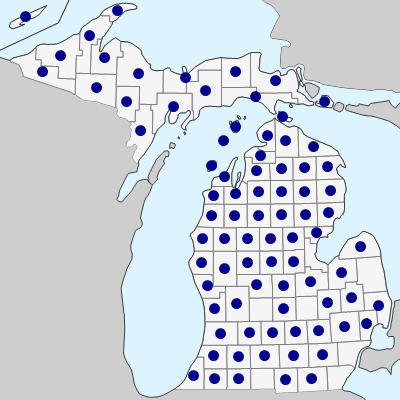 April 21, 2019. https://michiganflora.net/species.aspx?id=2371.